“Who Can I Turn To” was written for the British musical The Roar of the Greasepaint, The Smell of the Crowd. Producer David Merrick saw the production in London and decided to bring it to America, starting first with a nationwide tour. Around that time, Tony Bennett made this recording, which was a hit for him; this helped bring attention to the musical and helped ensure its success in the US. Who can I turn to when nobody needs me? But who can I turn to if you turn away? 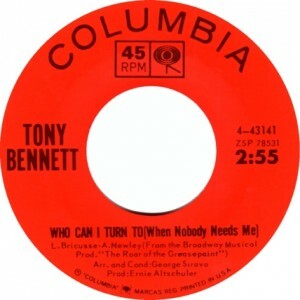 “Who Can I Turn To” was recorded on August 14, 1964 and released in 1964 on the album Who Can I Turn To. It was arranged by George Siravo. 1973: Harmony LP 12″: KH 32171 — Tony! “Who Can I Turn To” was recorded in September, 1976 but was not released until the 1999 Rhino release of Together Again. “Who Can I Turn To” (alternate, take 6) was recorded in September, 1976 but was not released until the 2003 Concord release of Together Again. “Who Can I Turn To (When Nobody Needs Me)” with Queen Latifah was recorded in 2011 and was released that year on Duets II. It was arranged by Jorge Calandrelli. “Who Can I Turn To (When Nobody Needs Me)” was recorded in 2012 with Gloria Estefan and released on Viva Duets.